How to Travel to Cuba Legally AFTER Trump's Announcement on USA Cuba Travel Regulations? Be in the know and subscribe for email updates from Authentic Cuba Travel. Our monthly Newsletters are full of great information on Cuba Education Tours, Cuba Cultural Tours, Cuba Architecture Travel, Cuba Festival Travel, Cuba Nature & Bird Watching Travel & Sport Tours, summarized in a quick-read format. Last minute discounts on Cuba education, cultural, nature, bird watching, architecture and sports tours, contests and featured authentic Cuba tours, all to keep you up to date with the world of Authentic Cuba Travel. Sign up to win a free spot in our Authentic Cuba Tours! HOW TO TRAVEL TO CUBA LEGALLY FROM USA AFTER PRESIDENT TRUMP'S ANNOUNCEMENT ON CUBA? LAST UPDATED: MARCH 28, 2019. On November 9, 2017 the Department of The Treasury's Office of Foreign Assets Control (OFAC) published the highly-anticipated new amendments to the 1963 Cuban Assets Control Regulations, 31 CFR part 515 (“Regulations”) to further implement the policy towards Cuba announced by President Trump on June 16, 2017 in Miami. The Regulations have been amended by most US administrations since they were first introduced back in 1963 under the Trading with the Enemy Act (50 U.S.C 4301- 4341) for either to relax or to restrict travel to the island, financial transactions, business and certain other activities. The most positive amendments were made under the administration of former President Barrack Obama. Interesting enough to notice that on May 2017, U.S. Sens. Jeff Flake (R-AZ) and Patrick Leahy (D-VT) led a bipartisan group of 55 Senators in reintroducing the Freedom for Americans to Travel to Cuba Act, legislation that would eliminate current restrictions on traveling to Cuba for tourist purposes. This act was introduced 2 years ago (2015) but supported by 8 senators only at the time. Despite the harsh rhetoric of President Trump on June 16, 2017 against Cuba, NONE of the existing 12 categories of Cuba legal travel have been eliminated. Furthermore, the General License authorization remains in place as well; although the General License for Individual People-to-people Cuba Travel has been eliminated. The US Embassy in Havana will remain open as well as the Cuban Embassy in Washington. Commercial flights and cruise trips will continue. Please, do notice that People-to-people Travel to Cuba for Educational Activies has not been eliminated. However, US citizens interested in this sort of exchanges with the Cuban people, now need to go to Cuba as part of a group organized by a US organization that promotes this sort of educational people-to-people exchanges. Click here to learn more about People-to-people Group Travel to Cuba with us. Even though US citizens are still prohibited (it was prohibited during Obama’s administration too) to go to Cuba to engage in tourist or recreational activities as Europeans and Canadians do, it is also possible for US persons to go to Cuba on their own without prior permission from OFAC within some of the 12 categories of authorized travel to Cuba which remain in place such as journalist activities, family visits, professional research, ect. People-to-people Group Travel to Cuba also remains in place for educational institutions; cultural, historical and religious organizations; private foundations; amateur sport teams; and US professionals and residents interested in cultural people-to-people exchanges with the Cuban people under the auspices of the General License, which means without having to ask permission to OFAC first. A General License for US travel to Cuba is created through a do it yourself process rather than by submitting an application and awaiting approval (Specific License). Fast, free and convenient, a General License simply requires a US Academic Institution or Organization subject to US jurisdiction to prepare all of its own documentation in a way that meets all OFAC guidelines. For many years, Authentic Cuba Travel has been organizing educational people-to-people programs for the most prestigious US Academic Institutions. US Universities, Colleges, High Schools; Religious Organizations, Architecture Organizations, Art Foundations and Museums; and others have trusted Authentic Cuba Travel with their travel plans to Cuba. We have a long list of referrals! Educational Activities Category 515.565(b) has been amended to eliminate the General License for Individual People-to-People Educational Travel. Brief background: On March 2016, President Obama introduced an amendment within this category of Educational Activities (515.565 (b)) to allow individual US travelers to visit Cuba on their own without being part of an organized group. The objective was to make more affordable and easier for US travelers to visit the Caribbean island. This amendment has been rolled back. NOW US travellers wishing to visit Cuba legally under this category 515.565(b), should do so as part of an organized group sponsored by a US organization that promotes people-to-people educational exchanges, if traveling within the category of Educational Activities. Following the harsh speech of President Donald Trump in June 2017, many US academic institutions, organizations and the market decided to postpone (or cancel altogether) their Cuba travel plans until clear regulations and procedures were in place. The wait is over now with the publication of the revised OFAC`s Cuban Assets Control Regulations of the Department of the Treasure. And American organizations can proceed with their travel plans in compliance with the new regulations. As anticipated, OFAC added new regulations to prohibit direct financial transactions with about 180 Cuban entities which are under the control of, or act for or on behalf of, the Cuban military, intelligence, or security services. At Authentic Cuba Travel, we have updated our itineraries to make sure that US organizations, educational institutions, religious organizations and the American travelers in general are not directly or indirectly dealing with any of these prohibited entities. We do monitor constantly any updates to this list of entities to make sure our itineraries remain in compliance for our American customers. 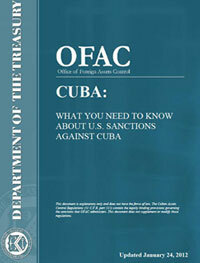 As also anticipated, OFAC Regulations also expanded its list of Prohibited Officials of the Government of Cuba (515.537) to include Ministers and Vice-Ministers; members of the Council of State and the Council of Ministers; members and employees of the National Assembly of People’s Power; members of any provincial assembly; local sector chiefs of the Committees for the Defense of the Revolution; Director Generals and sub-Director Generals and higher of all Cuban ministries and state agencies; employees of the Ministry of the Interior (MININT); employees of the Ministry of Defense (MINFAR); secretaries and first secretaries of the Confederation of Labor of Cuba (CTC) and its component unions; chief editors, editors, and deputy editors of Cuban state-run media organizations and programs, including newspapers, television, and radio; and members and employees of the Supreme Court (Tribunal Supremo Nacional). On January 14, 2011 President Obama announced US policy changes towards Cuba in an effort to reach out to the Cuban people, to increase people-to-people contact, to enhance the free flow of information, etc. On January 28, 2011, the US Treasury Department Office of Foreign Assets Control, or OFAC, published the new Regulations. Enhancing licensing (general licensing) for the purpose of USA- Cuba travel for educational, cultural, religious and journalist activities were among the new amendments of the 1963 Cuban Assets Control Regulations, 31 CFR part 515 (“Regulations”). On December 17, 2014 President Obama made another historical announcement intended to normalize relations with Cuba and to further ease travel restrictions to the Caribbean island. The highly anticipated easing of travel restrictions were implemented by OFAC on January 16, 2015 through a series of amendments and enhancements to the existing 12 categories under which persons subject to US jurisdiction can travel to Cuba. On January 26, 2016 and on March 16, 2016 new enhancements to the travel restrictions were introduced to better implement the people to people program reinstated by the Obama administration. The latest changes attempted to improve the relationship in between the American and the Cuban people by expanding the ability of US citizens to visit Cuba and making the trips more affordable and accessible. According to new changes implemented on March 16, 2016, US citizens could go to Cuba from US legally under the General License for People-to-people Educational Travel for Individuals. Can Americans travel to Cuba through a third country like Canada or Mexico? Absolutely! 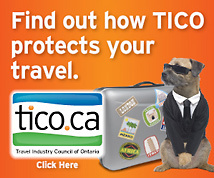 US authorized travelers can make their travel arrangements with any travel service provider (including tour operators, travel agents and airlines) in the USA, Canada or the rest of the world. Direct travel to Cuba from the US remains permitted and we can help booking your flights with most US airlines flying to Cuba including American Airlines, Delta, JetBlue, Alaska Airlines, United, Southwest. There are direct non-stop flights to Havana from Miami, Charlotte, New York, Newark, Atlanta, Houston, Fort Lauderdale, Los Angeles, Tampa, Orlando and Boston. We can also help with flight arrangements via Canada, Mexico or other country in the world. The following two Frequently Asked Questions are an extract from the latest Frequently Asked Questions published by the US Treasury Department Office of Foreign Assets Control, or OFAC. 36. As an authorized traveler, may I travel from a third country to Cuba and from Cuba to a third country? Yes, a person subject to U.S. jurisdiction engaging in authorized travel-related transactions may travel to Cuba from a third country or to a third country from Cuba. Persons subject to U.S. jurisdiction traveling to and from Cuba via a third country may only do so if their travel-related transactions are authorized by a general or specific license issued by OFAC, and such travelers are subject to the same restrictions and requirements as persons traveling directly from the United States. 25. Can I purchase a ticket to Cuba directly from an airline based or operating out of the United States? Yes, provided that you are authorized to travel to Cuba pursuant to an OFAC general or specific license. Airlines and travelers are responsible for maintaining records of their Cuba-related transactions for at least five years. Why US Organizations choose Authentic Cuba Travel? We specialize in custom-made programs for US Schools, US Cultural and Historic Preservation Organizations, US Religious Organizations, US Tour Operators and Travel Agencies, ect that meet OFAC guidelines. Virtually any US organization (US Schools, US Cultural and Historic Preservation Organizations, US Religious Organizations, US Tour Operators and Travel Agencies) can organize and sponsor a trip to Cuba under the General License for Educational Activities; the General License for People-to-people Travel, the General License for Support for the Cuban People, the General License for Professional Meetings; the General License for Religious Travel; the General License for Amateur and Semi- Professional Sports; the General License for Public Performances and Exhibitions; and others. However, most of these US organizations do not have the legal contracts with Cuban providers, the contacts and the know-how in Cuba to run their trips. It can take years for US organizations to obtain all approvals and permissions from the Cuban Ministry of Tourism and other pertaining Cuban bodies. has the largest selection of thematic Cuba tours (educational, arts, architecture, sports, ect) to choose from. Traveling to Cuba for tourism or recreational activities or free time in excess is not allowed for US citizens. The US embargo remains in place. The US travel restrictions to visit Cuba remain in place for American citizens. US travelers can go to Cuba legally only if traveling under the provisions of the General License or Specific License. There are two license options for Americans looking to travel to Cuba- General and Specific licenses. Here, we will explain both options. A General License for US travel to Cuba is created through a do it yourself process rather than by submitting an application and awaiting approval. Fast, free and convenient, a General License simply requires you to prepare all of your own documentation in a way that meets all OFAC guidelines. After President Trump’s announcement on new USA Cuba policy in June, 2017; and after the publication of the new amendments to the Cuban Assets Control Regulations in November 2017, the General License remains in place for most of the 12 Categories of permitted travel to Cuba. Only the General License for Individual People-to people Travel has been rolled out. The General License for Group People-to-people Travel remains in place within the category of Educational Activities (515.655) though. The specific license is much more complex and much lengthier and must be submitted to OFAC. Persons subject to U.S. jurisdiction who wish to engage in any travel within the 12 categories of activities specified in the CACR that does not meet the requirements of a general license will need to apply for a specific license from OFAC. Approval is dependent on the response received from Washington, and the wait can take anywhere from six weeks to months or even years. The General License for Educational Activities for Cuba travel from USA is created through a do it yourself process rather than by submitting an application and awaiting approval. Fast, free and convenient, a General License simply requires that a designated representative of the US sponsoring academic institution issues a letter that states the reason why the traveler (faculty, staff or student) is going to Cuba. After President Trump’s announcement on new USA Cuba policy in June, 2017; and after the publication of the new amendments to the Cuban Assets Control Regulations (31 CFR Part 515) in November 2017, the General License for Educational Activities (515.565 (a)) remains in place. Accredited U.S. graduate or under graduate degree-granting institutions; U.S. Academic Institutions; and U.S. Schools can organize and sponsor an educational trip to Cuba for their students, faculty and staff under the General License for Educational Activities, provided that the trip meets OFAC guidelines; and that an employee or other representative of the organization escorts the trip to make sure such guidelines are followed by all participants. Participants in these programs must carry a letter on official school letterhead that has been signed by a designated representative of the sponsoring academic institution at all times. This letter should state what the students, professors and other employees are traveling to Cuba for. OFAC defines a designated representative as the dean, academic vice president, provost, or president responsible for overseeing the institution's Cuban travel program. _ educational exchanges sponsored by Cuban or U.S. secondary schools involving secondary school students’ participation in a formal course of study or in a structured educational program offered by a secondary school or other academic institution, and led by a teacher or other secondary school official are authorized. This authorization allows for participation of a reasonable number of adult chaperones to accompany the secondary school students to Cuba. _ attendance at non-commercial academic seminars, conferences and workshops related to Cuba sponsored or co-sponsored by U.S. academic institution. _ teaching for 10 weeks at a Cuban academic institution by an individual regularly employed in a teaching capacity at the U.S. institution. For many years, Authentic Cuba Travel has organized educational programs for the most prestigious U.S. academic and educational institutions. Read some of the testimonials of American professors and teachers who have taken their students to Cuba with us. Please, do notice that we offer several educational familiarization tours for U.S. educators who want to travel to Cuba before taking their students. Qualifying teachers get to travel for free! Click here for more information. Do not wait any longer. Now is the time to start planning the next Cuba tour for your students. Your students will consider traveling to Cuba an experience of a lifetime. They will come home optimistic and inspired by fresh perspectives on what is possible not only personally but also socially. Request a custom-made Cuba Educational Trip and complimentary no-obligation Quote for your students, and check some of the resources we put at your service. Request School Tour to Cuba Now! The General License for People-to-people Cuba Travel is issued by the US organization sponsoring the trip. This organization is responsible for designing the itinerary (meeting OFAC guidelines), keeping all records, and sending an employee to ensure that each traveler complies with the criteria of this category of general license. After President Trump’s announcement on new USA Cuba policy in June, 2017; and after the publication of the new amendments to the Cuban Assets Control Regulations (31 CFR Part 515) in November 2017, the General License for People-to-people Travel (515.565 (b)) remains in place. However, it has been amended to eliminate the General License for Individual People-to-people Travel. U.S. organizations can organize trips to Cuba for educational exchanges not involving academic study to promote people to people contact. This is one of the new amendments to the 12 categories of legal USA Cuba travel implemented on January 16, 2015. Previously, organizations subject to U.S. jurisdiction had to apply for a Specific License for People to People Travel to Cuba to organize such Cuba travels. The trip should consist of a full-time schedule of activities intended to promote the exchange with the ordinary citizens of Cuba and to support the Cuban society. This full-time schedule must also include educational activities that result in meaningful interaction in between U.S and Cuban nationals. The activities engaged by each traveler are not with prohibited officials of the Government of Cuba. The trip to Cuba must be escorted by an employee of the organization. Example: a cultural or educational organization subject to U.S. jurisdiction organizes and sponsors educational and cultural trips to Cuba for its members and general public. The educational exchange does not involve academic study towards a degree program. 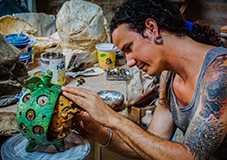 These Cuba educational & cultural trips do consist of a full-time schedule of activities where US citizens will meet, and learn side-by-side, with Cuban artists, curators, private art gallery owners and ordinary Cubans about Cuban arts, art history, ect. These Cuba travels qualify for the General License for People to People Cuba Travel. The same applies for an organization that promotes architectural studies, environmental protection, anthropological studies, music research, ect or any other subject of study not pursuant to a degree program. At Authentic Cuba Travel, we have been organizing such thematic people-to-people exchanges and educational trips to Cuba from the United States of America for years with great success. We have provided Cuba travel services, in putting together this sort of educational exchanges to Cuba, to prestigious U.S. organizations. We have a long list of U.S. referrals, and all the tools, resources and contacts needed in North America and in Cuba, to put together the most amazing cultural and educational exchange for your organization in a way that meets OFAC guidelines and regulations. Experience counts; call us today for a free consultation. The General License for Professional Research for US travel to Cuba is created through a do it yourself process rather than by submitting an application and awaiting approval. Fast, free and convenient, a General License for Professional Research simply requires US professionals to prepare their own documentation in a way that meets all OFAC guidelines. After President Trump’s announcement on new USA Cuba policy in June, 2017; and after the publication of the new amendments to the Cuban Assets Control Regulations (31 CFR Part 515) in November 2017, the the General License for Professional Research (515.564 (a.1)) remains in place. Only the General License for People-to people Travel (515.565 (b)) has been amended to eliminate the General License for Individual People-to-people Travel. However, the General License for Group People-to-people Travel remains in place within the category of Educational Activities (515.655(b)). In order to meet OFAC guidelines, the purpose of your trip to Cuba should be to conduct research related to your profession, professional background or area of expertise, including your area of graduate-level full time study. You Cuba travels should consist of a timetable of activities that are consistent with a full time schedule of professional research. Your trip to Cuba should not include free time or recreational activities in excess. Tourist travel to Cuba is not allowed. With so many thematic tours in our Authentic Cuba roster, chances are that whatever your profession you can find a tour that suits your profession, professional background or area of expertise. Click here to see all the tours to Cuba we have scheduled for 2019. If you do not find a tour that suits you, simply contact us or join our Cuba Engage Tours, Cuba Real Tours, or any other Cuba tours. With monthly departures these tours are organized under the auspices of US organizations that have been authorized by the U.S. Treasury Department’s Office of Foreign Assets Control (OFAC) to run cultural and educational people-to-people programs to Cuba. When traveling to Cuba under a general license, you must carry with you documentation that proves how you qualify for the license. You must have a notary public witness your signature to this document. _ A resume or CV (curriculum vitae). _ A letter from your employer, organization, agency, or other documentation that shows that you are engaged in a professional capacity. Recommended options include a letter supplied by your employer or organization, a pay stub, or a letter explaining your employment if you are self employed. The General License for Professional Meetings for US travel to Cuba is created through a do it yourself process rather than by submitting an application and awaiting approval. Fast, free and convenient, a General License for Professional Meetings simply requires US professionals to prepare their own documentation in a way that meets all OFAC guidelines. After President Trump’s announcement on new USA Cuba policy in June, 2017; and after the publication of the new amendments to the Cuban Assets Control Regulations (31 CFR Part 515) in November 2017, the General License for Professional Meetings (515.564 (a.2)) remains in place. In order to meet OFAC guidelines, the purpose of your trip to Cuba should be to attend professional meetings or conferences in Cuba that are NOT for the promotion of tourism in Cuba. Such event should be related to your profession, professional background or area of expertise, including your area of graduate-level full time study. Your trip to Cuba should not include free time or recreational activities in excess. Tourist travel to Cuba is not allowed. The General License for Support for the Cuban People for US travel to Cuba is created through a do it yourself process rather than by submitting an application and awaiting approval. Fast, free and convenient, a General License for Support for the Cuban People simply requires US individuals to prepare their own documentation in a way that meets all OFAC guidelines. After President Trump’s announcement on new USA Cuba policy in June, 2017; and after the publication of the new amendments to the Cuban Assets Control Regulations (31 CFR Part 515) in November 2017, the the General License for Support for the Cuban People (515.574) remains in place. In order to meet OFAC guidelines, the purpose of your trip to Cuba should be to engage in a full-time schedule of activities that enhance the people-to-people contact with the Cubans; support civil society and private enterprise; and result in meaningful interaction with Cuban citizens. Your trip to Cuba should not include free time or recreational activities in excess. Ordinary tourist activities are not allowed (renting a bike a spending the whole day biking through the city just for sightseeing or going to the beach, for example). US individual travelers can not engage in financial transactions with Cuban entities which are under the control of, or act for or on behalf of, the Cuban military, intelligence, or security services are not permitted. For example: an American individual plans to travel to Cuba on his/her own (or with a group of friends) to learn about the Cuban culture and support the Cuban people in order to 1) launch a new privately-owned business venture; or 2) volunteer with a recognized nongovernmental organization; or 3) carry activities aimed at strengthening civil society; or others with similar intent. During this Cuba trip the US traveler stays in a Casa Particular (private rental accommodation owned by a Cuban family or individual) or in a hotel (not on the OFAC restricted list of Cuban entities); the American individual or group of individuals does eat most of his/hers meals in Paladares (family restaurants owned by a Cuban family or individual) and shop at stores owned by Cuenta Propistas (self-employed Cuban entrepreneurs); all while engaging with the Cuban owners of these entities in conversations about their day-to-day life, way-of-living, and entrepreneurial challenges and dreams. The full-time schedule of activities of the American individual traveler (or group of travelers) will result in a meaningful interaction with the Cubans and; therefore, it may qualify for the General License for the Cuban People. You can always join any of our GROUP TOURS TO CUBA that already include the General License for Cuba Legal Travel. With monthly departures these tours are organized under the auspices of US organizations that have been authorized by the U.S. Treasury Department’s Office of Foreign Assets Control (OFAC) to run cultural and educational people-to-people programs to Cuba. After President Trump’s announcement on new USA Cuba policy in June, 2017; and after the publication of the new amendments to the Cuban Assets Control Regulations (31 CFR Part 515) in November 2017, the General License for Religious Travel (515.566 (a)) remains in place. Persons subject to U.S. jurisdiction can travel to Cuba to engage in religious activities in Cuba. This includes religious organizations, its staff and members. The religious travels to Cuba must consist of a full-time schedule of religious activities. After President Trump’s announcement on new USA Cuba policy in June, 2017; and after the publication of the new amendments to the Cuban Assets Control Regulations (31 CFR Part 515) in November 2017, the General License for Semi-Professional & Amateur International Sports Competition (515.567 (a)) remains in place. Traveling to Cuba to participate in athletic competitions in Cuba is possible for amateur or semi- professional athletes. The athletic competition must be sponsored by an international sports federation relevant to the sport; and it must be open to attendance by the Cubans. After President Trump’s announcement on new USA Cuba policy in June, 2017; and after the publication of the new amendments to the Cuban Assets Control Regulations (31 CFR Part 515) in November 2017, the General License for Public Performance, Clinics, Workshops, other Athletic and Non-Athletic Competitions and Exhibitions (515.567 (b)) remains in place. U.S. citizens can travel to Cuba under this general license to participate in a public performance, clinic, workshop, athletic competition or exhibition in the Caribbean island if meeting certain OFAC criteria. Such as; the event held in Cuba is open for attendance by the Cubans. 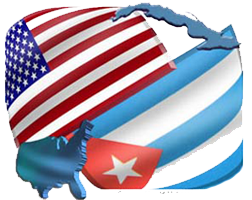 U.S. profits (after cost) will be donated to an independent Cuban organization or U.S. based charity for the benefit of the Cuban people and to promote the people-to-people exchange in between American and Cuban citizens. Clinics and workshops in Cuba must be held under the auspices and sponsorship of an authorized US authorized organization or traveler. Example: a U.S. baseball team can travels to Cuba under this General License to compete with a Cuban baseball team in a series of friendly games at a Cuban stadium or sports school. These games are not held under the auspices of an international organization. However, the game will be open to the public and any profits after costs will be donated to a Cuban non-governmental organization or U.S. charity. Travel to Cuba for journalistic activities is now authorized under the General License; provided the traveler is at least regularly employed as a journalist or supporting broadcast or technical staff; or a freelance journalist with a previous journalistic experience. And whose schedule of activities does not include free time or recreation in excess and it is consistent with a full time schedule of journalistic activities. Employees, contractors, or grantees of the United States Government, any foreign government or any intergovernmental organization (of which US is a member or observer) can travel to Cuba on official business on behalf of their government or intergovernmental organization. The following FAQs will help you understand OFAC regulations more completely and will provide more information on licenses and license qualification. Can Americans travel to Cuba legally? As a full-time professional, do I qualify for a General License? Do I need to apply with the government to receive a General License? How does the General License work? As an authorized traveler, may I travel from a third country to Cuba and from Cuba to a third country? As a university professor or secondary teacher, can I take my students on legal Cuba tours? As the leader of a religious organization, can I organize a religious trip to Cuba for members of my organization? What is individual people-to-people travel, and how do the new regulations impact this travel authorization? Will people-to-people travel still be authorized, what does group travel refer to? Will organizations subject to U.S. jurisdiction that sponsor exchanges to promote people-to-people contact be required to apply to OFAC for a specific license? Does the new regulations limit the means by which US citizens may buy airline tickets for authorized travel to Cuba? How do I know that a Cuban provider is affiliated with a prohibited company? As a US Citizen, am I allowed to spend money in Cuba? What can I bring back from Cuba? Can Americans go to Cuba legally using a Canadian Agency? Yes, there are many avenues to legal Cuba travel for Americans. In fact, the process is often simple and quick. Please don’t hesitate to give us a call for more information on joining one of our tours. Students, faculty and staff of accredited US graduate or under graduate degree-granting institutions; US Academic Institutions; and US Schools. Secondary school teachers, students and staff taking part in courses or structured program offered by the secondary school. Amateur or semi-professionals athletes attending athletic and non-athletic competitions in Cuba. Full time professionals attending professional meeting or conferences in Cuba. Full time professionals conducting research in their specific professions and professional areas while in Cuba. US residents attending certain clinics, workshops, exhibitions and public performances in Cuba. Members and staff of religious organizations. Those travelling for official government business. Persons visiting close relatives who are Cuban nationals. Persons visiting close relatives who are government employees that have been assigned to the US Interests Section in Havana. Persons who have received a Specific License to travel to Cuba. Yes, provided that the purpose of your trip to Cuba should be to conduct research related to your profession, professional background or area of expertise, including your area of graduate-level full time study. A general license will be prepared and written by you and with no need for further permission from OFAC. You must have the license with you when traveling to Cuba and must present it to US Immigrations officials upon departure (if flying directly to Cuba from a US airport) as well as upon return if asked. Yes, a person subject to U.S. jurisdiction engaging in authorized travel-related transactions may travel to Cuba from a third country or to a third country from Cuba. Persons subject to U.S. jurisdiction traveling to and from Cuba via a third country may only do so if their travel-related transactions are authorized by a general or specific license issued by OFAC, and are subject to the same restrictions and requirements as persons traveling directly from the United States. Yes. Thanks to changes in travel regulations as of January 2011 and January 2015, accredited secondary schools and universities are now eligible to take students, faculty, and staff (including but not limited to adjunct and part time staff) to Cuba. The following question/ answer is an extract from the latest Frequently Asked Questions published by the US Treasury Department Office of Foreign Assets Control, or OFAC. "14. Are secondary schools and secondary school students permitted to engage in travel-related transactions under the general license for “educational activities”? Yes. Educational exchanges, including study abroad programs, sponsored by Cuban or U.S. secondary schools involving secondary school students’ participation in a formal course of study or in a structured educational program offered by a secondary school or other academic institution, and led by a teacher or other secondary school official are authorized. Such exchanges must take place under the auspices of an organization that is a person subject to U.S. jurisdiction, and a person subject to U.S. jurisdiction who is an employee, paid consultant, agent, or other representative of the sponsoring organization (including the leading teacher or secondary school official) must accompany each group traveling to Cuba. For a complete description of what this general license authorizes and the restrictions that apply, see 31 CFR § 515.565(a)(2)(vi). This authorization allows for participation of a reasonable number of adult chaperones to accompany the secondary school students to Cuba." Yes. You are required only to carry a letter on official letterhead that has been signed by a representative of the sponsoring US religious organization who has been designated to be the official responsible for that organization’s Cuba travel program. Simply explained, individual people-to-people travel refers to US citizens going to Cuba on their own for educational activities that do not involve academic studies pursuant to a degree program. Under the new regulations, this type of “individual” travel can only takes place as part of a group that is sponsored by a US organization that promotes educational people-to-people meaningful interactions with the Cuban people. People-to-people travel is educational in nature but not for the pursuit of a degree program. The trip must be organized by a US organization that promotes meaningful interaction with Cubans and people-to-people exchanges. A representative of the US sponsoring organization travels with the group to make sure that a full time schedule of educational activities is maintained; that no free time in excess is enjoyed; that no engagement in tourist activities takes place; ect. In addition, no contact with prohibited officials of the Government of Cuba or members of the Cuban Communist Party is allowed. No. To the extent that proposed travel falls within the scope of an existing general license, including group people-to-people educational travel, persons subject to U.S. jurisdiction may proceed with sponsoring such travel without applying to OFAC for a Specific license. It is OFAC’s policy not to grant applications for a specific license authorizing transactions where a general license is applicable. No. The new regulations do not change the means by which Americans and US organizations traveling to Cuba pursuant to the 12 categories of authorized travel may purchase their airline tickets. The names of the entities and subentities that the State Department are published on the Cuba Restricted List, which is available on the State Department’s website and in the Federal Register (updates to the Cuba Restricted List will also be published in the Federal Register). The per diem rate previously imposed no longer applies, and there is no specific dollar limit on authorized expenses. Authorized travelers may engage in transactions ordinarily incident to travel within Cuba, including payment of living expenses and the acquisition in Cuba of goods for personal consumption there; other expenditures, other than those directly incident to the traveler’s authorized activities in Cuba, are not authorized. Persons authorized to travel to Cuba may purchase alcohol and tobacco products while in Cuba for personal consumption. Authorized travelers may also return to the United States with alcohol and/or tobacco products acquired in Cuba as accompanied baggage for personal use. OFAC considers “personal use” of an imported item to include giving the item to another individual as a personal gift, but not the transfer of the item to another person for payment or other consideration. Absolutely! US authorized travelers can make their travel arrangements with any travel service provider (including travel agents and airlines) in USA or abroad. Authentic Cuba Travel Lifetime Deposits offers any of our tour participants forced to delay a departure to retain their deposit for use at a later date at no extra charge and NO QUESTIONS ASKED. Authentic Cuba Travel is offering a new level of service for our loyal teachers: the FREE Cuba Explorer Tours. All teachers may qualify! Nobody knows Cuba as Authentic Cuba Travel! Our staff is fluent in English and Spanish and have lived and worked in Cuba Travel Industry for over 10 years. Guaranteed! Sustainable tourism is where our Cuba tour participants can enjoy their holiday and at the same time respect the authentic culture of local people and also respect the environment. 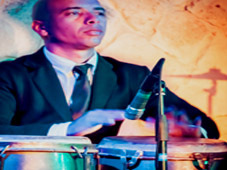 Authentic Cuba Travel escorted tours to Cuba's international Festivals: Jazz Festival, Book Fair, Havana Art Biennial, Fire Festival and more! Authentic Cuba Travel's nature and bird watching eco tours grant access to UNESCO Biosphere Reserves, National Parks & Protected Areas! Authentic Cuba Travel's Cuba cultural tours feature visits to Cuba’s premier art galleries & artists' studios.